Yay more pasta! I could seriously eat pasta every day and never get tired of it. Especially because there are so many types of pastas, sauces, fillings, and more! So forgive me if you tire of these gratuitous pasta dishes. I never do. So get this, the first time my husband ever ate pesto was only a couple of years ago. He saw it on a restaurant menu, and didn’t even really know what it was. I told him that I LOVE it, and the smell of pesto always reminds me of the summer I spent in Italy. So he gave it a try. Though he did enjoy it, he didn’t feel so good after our dinner. He hadn’t eaten anything else unusual that day, but by the following day, he felt much better. We wondered if he was allergic to pesto. It was the only thing he’d never eaten before. I found this terribly saddening and a downright travesty. Because if he did truly have a pesto allergy, then I could never cook anything that included pesto. He didn’t eat it again for a long time, but one day he worked up the courage to try it again to test out our allergy theory. And HOORAY! Turns out he’s not allergic. Since then, we’ve had quite a few pesto dishes. And much to my delight, he has enjoyed them all. 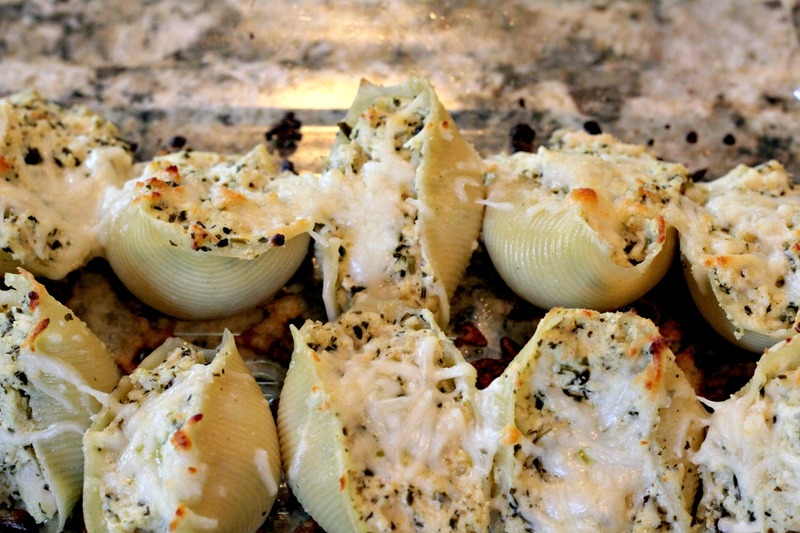 These stuffed pasta shells are REALLY good and surprisingly filling. Pesto just has such a powerful, distinctive flavor. And the cheese….well, cheese is good on anything. You could easily leave out the chicken and make this a vegetarian meal, too. Plus, these are just as good reheated. I had leftovers for lunch and they are still delicious! This recipe also came with freezing instructions in case you want to plan ahead and have an easy meal on hand later! In a large bowl, combine the rest of the ingredients, except the 1/4 cup of cheese for the topping. Fill the pasta shells with the filling and place in a baking dish. Sprinkle the remaining 1/4 cup of cheese over filled shells. 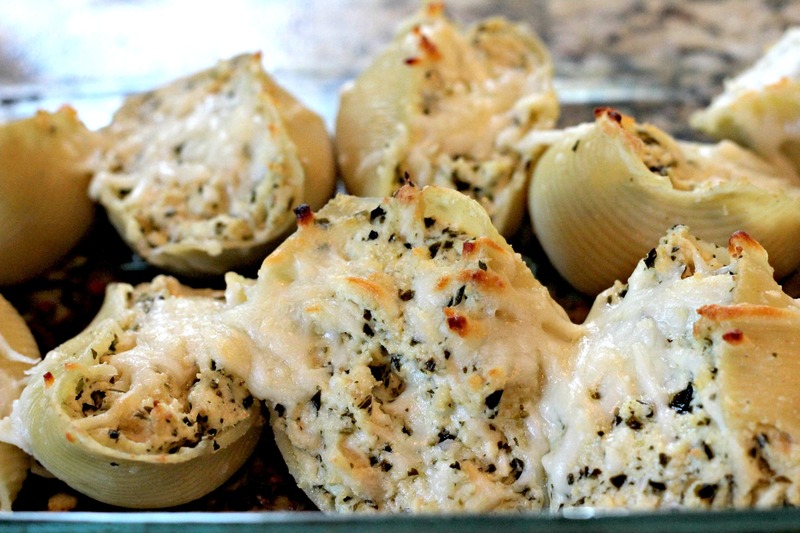 Bake shells uncovered for 30 minutes or until shells are bubbling hot and cheese melts. For make ahead/freezer meals - Prepare as directed but place filled shells in an oven- and freezer-proof baking dish. Top with remaining 1/4 cup of cheese over filled shells, cover and freeze. When ready to prepare, defrost. Preheat oven to 350 degrees and bake shells uncovered for 35-40 minutes or until shells are bubbling hot and cheese melts. You said it! Such a divine combo. I am going to have to stop visiting the NormalCooking blog because I want to reblog and eat everything she makes! 🙂 This looks fantastic. I’m sure our family will love it! Wonderful as always! I think you should look into publishing a cookbook! I’m going to just have to make this one very soon Yes, I love pastas too What about tomatoes, have you ever just placed some Italian diced tomatoes with onions and bell peppers in a skillet or other dish even, and let these stuffed pasta shell rest on top? That sounds good to me Maybe shrimp in them would also be a great twist. First, though, I will prepare them just as you have They look and read very wonderful. Mmmm that does sound good! This was the first time I’d ever made this dish, so I didn’t venture out of the box too much But you’re right there are lots of ways to dress these up a bit! Those look excellent… You could plate three or four really prettily for very elegant appetizer! That’s a great idea! They are really filling, though (we each could only eat 3 for dinner) so you’d probably want to stuff them with less of the mixture But you’re right they certainly have the look of a pretty appetizer! Oh that sounds delicious! What a great idea, thanks for sharing! ahhh..I made 2 batches and froze them BUT…. I forgot to cook the chicken. Well that depends…did you just forget the chicken altogether? If so, I’m sure these would taste good as vegetarian pasta shells! Or you could cook some chicken and kinda shove it down into the filling after they’ve thawed. If you meant that you put chicken in the shells and just forgot that it needed to be cooked…then I’m not sure they can be salvaged. Hope it works out for you!